Happy Tuesday, friends! Today I'm excited to say that this post is about neither my daughter's first birthday nor children, babies...or parties. Breathe a collective sigh of relief if you're all babied out from the last two weeks! Today's post is the first project I have to show you from my craft room make-over! I'll be discussing that particular room over the next several weeks...and eventually I'll even get to a big reveal. And, when it's all said and done, you'll be utterly sick of my craft room. Anyone else out there love Pick Your Plum? I'm kind of obsessed and get giddy when 8am rolls around and their deal of the day shows up in my inbox. It's like Christmas, Monday-Friday! I've made a couple purchases since I discovered them last Fall, one of which was 3 sheets of iron-on vinyl in red, gray and black. I used some of it for a Christmas throw pillow (which I did not give a tutorial for, alas) and have been saving the rest for the perfect project. I finally decided the perfect project would be embroidery hoop wall art for my craft room. I snap (photos of said crafts). And, I click (away at my computer so you can see those crafty photos). My vinyl sheets from Pick Your Plum came with a handy instruction sheet (and, a yellow laughy taffy, which made my day) so I followed those instructions carefully. When I arranged my images on my Silhouette program, I made sure to place the graphics strategically to maximize what I could get from the vinyl. You can see in the top photo that I included some numbers and words. Those are for other projects. I wanted very little waste to take place!! I then gathered three hoops and three fabric scraps from my collection. The black and white print is part of the ikea curtains I purchased for that room. They were 96 inches long and my windows were only 84 inches from the ground. Which scored me 12 inches of material from each panel. Awesome! After my graphics were cut, I ironed each one onto a different fabric scrap and placed each scrap into a hoop. Then, I trimmed the fabric around the hoops using some sharp pinking shears. When my three hoops were complete, I attached a length of twine to each one and hung them from the knobs of a mirror, hanging above a storage unit in my craft room. I love how they turned out! And, while I can't show you too much of the room yet, I can tell you that they look really great with the rest of what I have going on in that space! Ever wonder about the girl behind the camera?? Well, there she is. Snapping away. 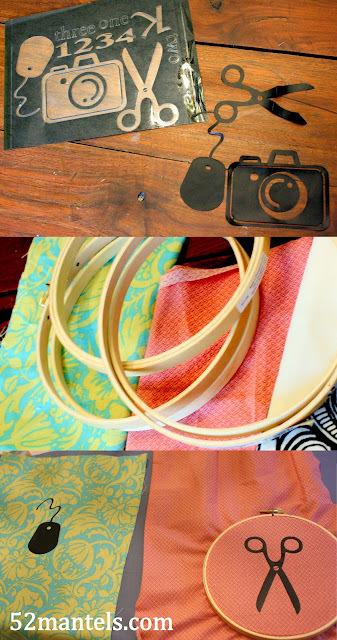 Here's the tiniest sneak peak at a few new organizational accessories in my craft room. Don't you love the pattern and color going on?? 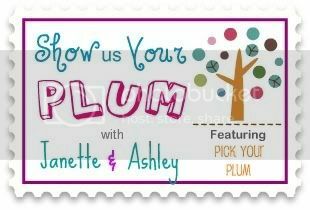 I'm linking this little project up at the Show Us Your Plum party! Because, how much do I want to win that box of crafting supplies?? A lot. That's how much. Well I never heard of the Plum place, so tomorrow I will check them out, and as cute as your embroidery hoops turned out, I've gotta tell you for me it's all about how they look with that mirror. I need a craft mentor. Someone to come into my home and say today Bliss you shall make a _____ then maybe I would get something done. That is so damn cute, adorable, love it! These are so cute! You know where I am going right after I hit send! Following you now from the power blogger "tribe:. Looking forward to it- i love your blog. This is FABULOUS! I love them!!! Holly @ Lifeasathrifter . . . a new "tribe" member! These are so cute, Emily! I'm looking forward to a full reveal because I always love seeing other people's creative spaces. Pinned to my Silhouette projects file. What? Iron-on vinyl? I have GOT to get a silhouette!! Love your latest project. So pretty! Emily, I am also in the process of creating a craft room in my home, so I will take all the advice and ideas you can give me! :) I can't wait to have it finished and I can't wait to see yours! Oh this is just too cute!! Is the rest of your craft room as cute as your new art? Mine is a scary scary place...my dog won't even go in there... my kids can't because I run screaming if they try.. they could step on a needle. I mean.. I hardly have time to finish what I'm working on, much less clean the room. haha! These are O so cute! So clever and creative you are! I am a new GFC follower. I found you on a grow your blog hop. I would love for you to stop by my site and return the favor and follow me back as well. If you are interested also check out our current giveaways. We have something for everyone right now. I too love PYP. I too have some embroidery hoops that I will be putting fabric in... thanks for the inspiration to add something a little extra to them. Now what is that below the hoops?! You're killing me! I am right now in the midst of reorganizing and redecorating my office to become more of a crafting space. I NEED/WANT your inspiration. Hurry with the reveals!! Thanks for all the comment love!! You ladies rock! Love them! I need one of those machines, darn it! Love the magazine holders too. Target dollar bin rocks! Those are absolutely ADORABLE! Thanks for the inspiration. PS. I followed you on linky, but I really want to follow you by e-mail? Do you have a place to sign up? I feel I should say a happy birthday to the new craft room...kind of as a transition out of the birthday series into the craft room. :) This project is awesome...I am totally in love with that mirror! Great use of those hoops. Very cute! So excited to get to know you better! Emily!!! I LOVE IT!!! I came across Pick Your Plum last week... and oh my gosh.. so much eye candy!! Hope you'll link up to my link party! Jessica, your newest Linky follower! OMG I am IN LOVE with these! Fabric, icons, everything...so cute! I love my silhouette too :) Pinning this! And prob going to have to do something similar to my room this is just too awesome! Love it! It's SO true - you craft, you take photos, then you put them in a post. Repeat. I love the fabric too! So cute!! I love the images you used!! I just got a silhouette and I've got some PYP Vinyl too!! I've gotta start gettin' crafty! :) VERY CUTE!! Thanks for linking it to Show Us Your Plum!! What a cute project! Love the colors and pics you chose! I would love for you to stop over and link up to my party which is happening NOW! I would love to have you! "sew sew" cute!!!! what a great/unique idea! Adorable! Great colors, design and patina. I just recently found out about Pick Your Plum, love it. Thanks for linking up at Burlap & Denim. Very pretty and eye-catching-pinning for ideas of my craft room makeover-and love that mirror! Totally love PYP. And, I get sooo excited when I get the emails, too. LOVE THESE!!! Featuring your art tonight at the Highlight Party. Can't wait to see all the projects that will go into your craft room. I can't wait to be sick of it!! ha! Thanks again for sharing at the party. I love it! Can't wait to see more! I would love for you to share this at my link party! These are the cutest things ever!!!! I love it! I really want to do this now! Thank you so much for sharing at Thursday's Temptation.